Tarabukin on the etching by V.D. Falileeva, 1918. Nikolai Mikhailovich Tarabukin (Николай Михайлович Тарабукин; 1889–1956) was an art historian and philosopher. Based on Tarabukin's biography on the website of Yaroslavl State University. Born in the village Spasskoye of the Spassk Uyezd in the Kazan Province. In 1911, he finished the Yaroslavl gymnasium and entered the History and Philology Faculty at Moscow University; there he studied philosophy and art history, passed examinations in art history, philosophy, logic, psychology, and literature. In September 1912, he left Moscow University and entered the Demidov Juridical Lyceum in Yaroslavl. In 1913–1914, he took a trip abroad in order to visit museums and study architecture. In December 1916, graduated from the Demidov Lyceum (his diploma was given on 19 April 1917) and moved to Petrograd. From 1917 Tarabukin devoted himself to the history and theory of fine art. In 1919–1920, he was drafted into the Red Army, worked as a lecturer in art at the Department of Political Education of the Moscow Military District, and was an employee and lecturer of the Central Department of Military Education Institutions. In 1920–1921, he gave courses in the history of environmental arts at the State Singing Academy and taught the history of Russian art at the former 1st Gymnasium, and lectured at the Proletkult (Russian for Proletarian Culture) and Moscow Institute of History and Art Research and Museum Studies. 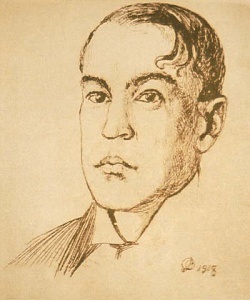 In 1921–1924, Tarabukin was the full member and scientific secretary of the Institute of Artistic Culture (INKhUK). 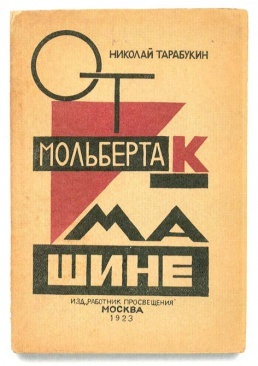 1924–1930, worked at the State (originally — Russian) Academy of Artistic Sciences, being elected its corresponding member in 1928 and the Vs. Meyerhold State Theatre Workshops. 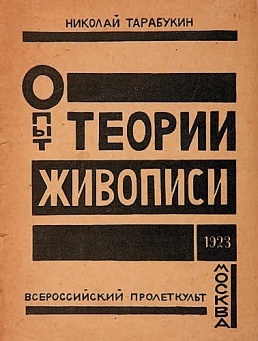 15 September 1927, employed by the All–Union State Institute of Cinematography as a lecturer in the history of art. Summer 1928, elected head of the section of the State Academy of Artistic Sciences studying the heritage and works of Vrubel. 1 October 1930, confirmed as associate professor of the Institute of Cinematography. 15 October 1934, taken on as an associate professor in the history of environmental arts at the A.V. Lunacharsky State Institute of Dramatic Art. 1938, confirmed as acting professor in the history of environmental arts at the Institute of Cinematography and the Institute of Dramatic Art. 1942–1943, gave a course in the general history of art at Moscow State University and the Artistic and Industrial Institute (until 1944). 1944, confirmed as acting head of the Department of Art History of the Institute of Dramatic Art. 1944–1949, gave a course in the history of art at the Studio School of the Moscow Academic Arts Theatre. From 1946 he lectured at the Literary Institute and was a senior staff scientist of the section studying the architecture of the peoples of the USSR at the USSR Academy of Architecture. Died in Moscow. Buried, under his will, at the estate Voronovo near Moscow. Tarabukin devoted one of his last works to the history and architecture of this estate. Ot mol'berta k mashine, 1923. Cover by Antonina Sofronova. This page was last modified on 26 April 2016, at 22:57.